In the 1970s, engineers drew a horseshoe around Charleston, South Carolina — the planned route for Interstate 526, also known as the Mark Clark Expressway. The highway was to extend from Mt. Pleasant in the north to James Island in the south. It was to be a traditional highway bypass, the kind that were being built across the country in those days, changing the nature of cities in profound ways. But Charleston never got around to completing the arc. It comes to a stop about eight miles short of its planned destination in West Ashley, leaving the rural and suburban communities ahead un-scarred. A few years ago, however, county officials decided to complete the 40-year-old highway plan after all. They applied for, and received, $420 million from the state transportation infrastructure bank. Since then, the state has been moving forward with plans to construct an eight-mile stretch of highway from West Ashley through rural Johns Island to James Island, crossing the Stono River twice. 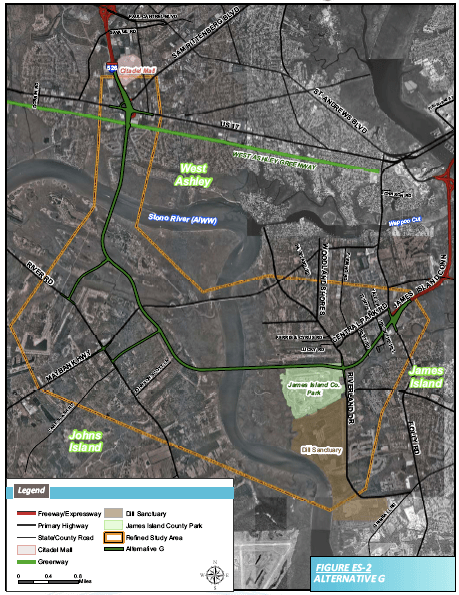 Under contract to Charleston County, the South Carolina Department of Transportation has continued to beat the drum for highway expansion even in the face of mounting public outcry and the introduction of a less-costly alternative proposal. 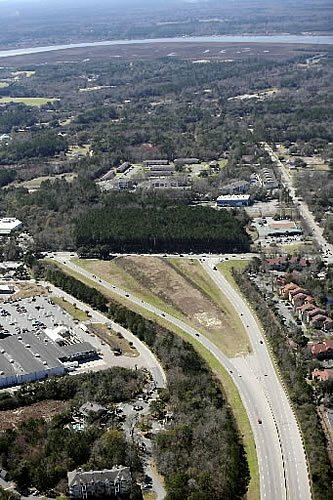 In its refusal to consider ideas that do not conform to the limited-access highway model, SC DOT has staunchly upheld the bias for highway development that afflicts state transportation authorities nationwide. In Charleston, reception to the I-526 expansion has been chilly, and an organized and outspoken opposition movement has taken hold. Locals question whether a 70s-era highway plan is still the proper formula for this historic yet increasingly modern southern city. Opposition has been strong enough that county officials have brought the plan to a standstill while they consider alternatives. But will advocates for a different approach successfully disrupt the entrenched practices of the state DOT? Some of the loudest cries have come from rural and suburban communities worried they’ll be overwhelmed by the sprawling residential and commercial development — subdivisions, strip malls, parking lots — that come hand in hand with highways. In a series of five public meetings on the project held by the South Carolina Department of Transportation, more than 1,200 residents turned out with a range of concerns — more than 62 percent of them opposed, compared to 32 percent in support, according to records kept by SC DOT [PDF]. Residents questioned whether the project would increase traffic and development and cost more than it is worth. Kate Parks, land use program director with the Coastal Conservation League, said the extension will destroy wetlands and fuel sprawl. Parks says the project will jump-start rapid development on about 1,000 acres surrounding the new highway that are already zoned for development. But much of the remaining land is agricultural and could be rezoned. Parks also insists that the city’s major traffic problems are concentrated elsewhere, mainly along I-26, and questioned the wisdom of using the state’s limited resources on a project that won’t solve those problems. The League’s plan was one of 38 that were eliminated from consideration after a review by the state Department of Transportation. The DOT’s “preferred alternative” is a four-lane limited-access parkway with at-grade intersections, to be divided by a 15-foot median. The road will have a posted speed limit of between 35 and 45 miles per hour, and, in a tinge of green, will be equipped with a path for biking and walking. Make no mistake, this is still a massive road expansion. State officials estimate the project will cause the destruction of 17 acres of wetlands. It will create a noise impact on 137 homes and businesses and cost $489 million in 2009 dollars. Still, it is, on balance, the least destructive of the seven final proposals that cleared the state DOT’s screen, which were all variations on the highway extension theme. David Kinard, project manager at SC DOT, acknowledged there were a lot of concerns about the plan “on both sides.” But the project has now been vetted through the agency’s public involvement process, he said, and the state DOT has been waiting on final word from the county before seeking additional environmental approval. Now the situation is coming to a head. In the face of public opposition, county officials recently asked SC DOT to consider some alternative or modified proposals, including the Conservation League’s proposal. Earlier this week, SC DOT fired back, refusing to go back on its recommendation for the highway expansion. State officials told the county they must choose between DOT’s “preferred alternative” or the “no-build” option. The county has yet to respond. Charleston Mayor Joseph P. Riley, Jr. told local media sources that he remains supportive of the highway expansion. But some members of the county council have indicated they disagree. I read this article with great interest! If the locals don’t want the highway, who is it serving? Understandably residents do not want to see a major traffic sewer through the centre of what looks like a beautiful area. After the Embarcadero highway through the waterfront of San Francisco came down, traffic does not seem to be suffering. In fact, it is positively easy to drive or ride through there. Plus the whole area has been rejuvenated, a big boost for tourism and business there. It really seems like major highways like this bring no benefits for the majority, while devastating wide tracts of previously pleasant lands. It’s great that the whole world can read and see the lessons from these mistakes. The public can easily see what works, and what doesn’t. The public should be involved in what should be a public decision! Considering both ends of this highway are already directly connected by the Savannah Highway (5 lanes, with some, but limited, pedestrian crossings) at a significantly shorter distance, this is a pure Land Development projects. From an environmental standpoint, 17 acres of wetland and noise impacts aren’t anything to write home about. The bigger question is the environmental impact of the development that will occur due to the highway, I guess you could call it the projects Secondary and Tertiary environmental impacts. Sometimes, there does need to be land development due to population pressure, and those areas need transportation access that may include highways. I doubt the first condition is met – like many southern cities, Charleston has low population density (less than 1/4th of Portland, OR, a not-particularly dense city). It’s way more likely that developers are looking to make money, and see fresh-to-develop land as the easiest and most reliable way to do so. Let’s hope the “bike path” is well designed and safe. We have plenty of “bike paths” along major arterials in the suburbs of chicago and they are very dangerous to bicyclists at the intersections. My wife was injured riding on one. In America we have a history of doing side paths in incredibly stupid ways. They can be done quite well or the typical American way. the old buildings are the only thing preventing all of Charleston from being a suburb. i was there this summer. its a mess.